Herrick, Feinstein LLP is one of the nation’s most prominent mid-sized law firms, providing a full range of legal services to businesses and individuals around the world. In recent years, they have handled cases that range in diversity and complexity; solidifying their reputation as a creative problem-solver while maintaining a sharp focus on their clients’ best interests. NEO saw the firm's recent annual reports to employees and clients as an opportunity to communicate this point of difference and the reason for their enduring success. Illustrations highlighting the year's most important matters emphasize the firm's creative approach to resolving complex cases. In some cases, infographics add dimension and context to the specific matter. 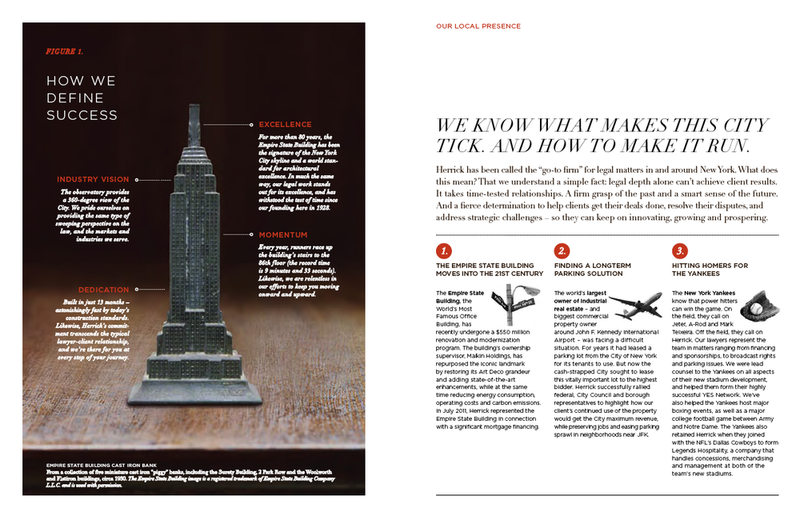 The incorporation of New York City artifacts (displayed throughout their offices), anchors the report and alludes to the company’s unique culture and heritage of operating in the tri-state area. 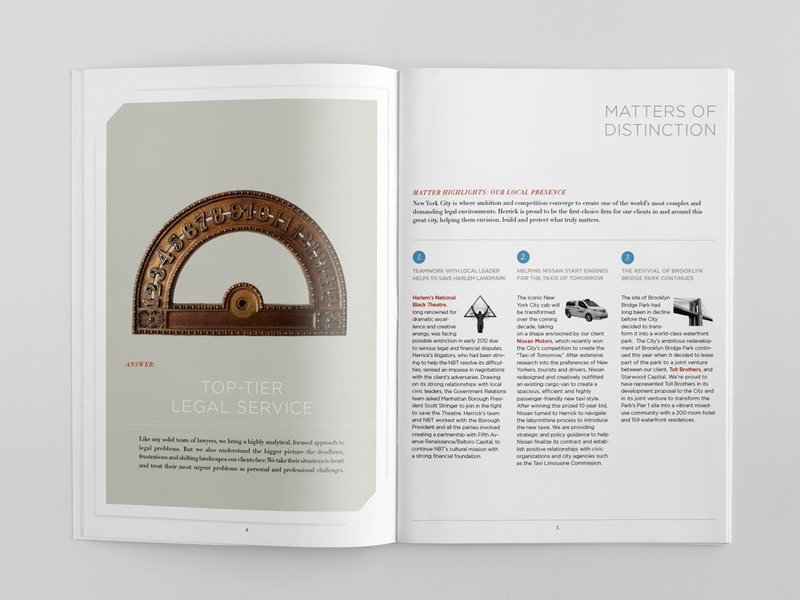 NEO created an overarching theme for the report, “Distinctly Herrick,” to highlight the firm’s unusual cases (matters) and their singular approach to providing top-tier legal services to clients. 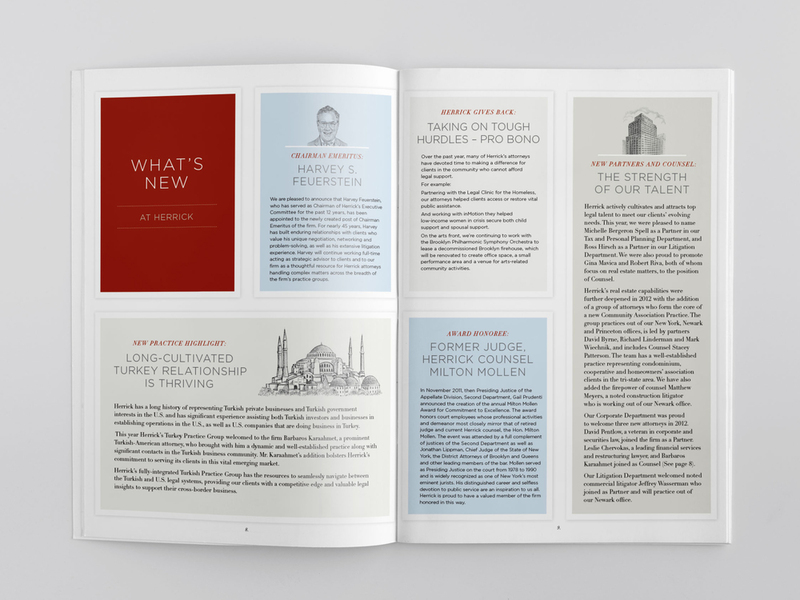 An upfront narrative section showcasing the firm’s work on local, national and global matters underscores Herrick’s continuing influence and reach.